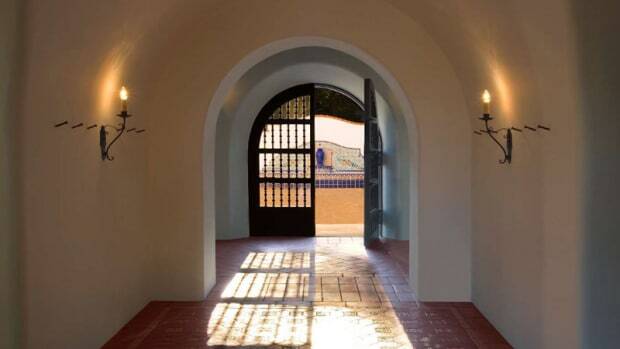 Elaborate and formal, the architecture—inspired by the country houses of David Adler and Delano and Aldrich—had Doyle Herman Design Associates thinking in similar terms with respect to exterior “rooms” and plantings. Designed to complement the architecture, the outdoor spaces were arranged according to traditional design principles with an emphasis on strong axes. To start, the whole site underwent a major topographical change, in part, to address the fact that the house was sited without a formal approach or parking courtyard. Also, they needed to incorporate an extensive drainage system. In general, elevation changes were maximized to set up destinations and private garden spaces. A lengthy driveway now leads to a formal courtyard, then continues around the house, flanked by sheared Taxus hedges. The drive itself is on axis with rows of trees in a newly installed 16-tree apple orchard. 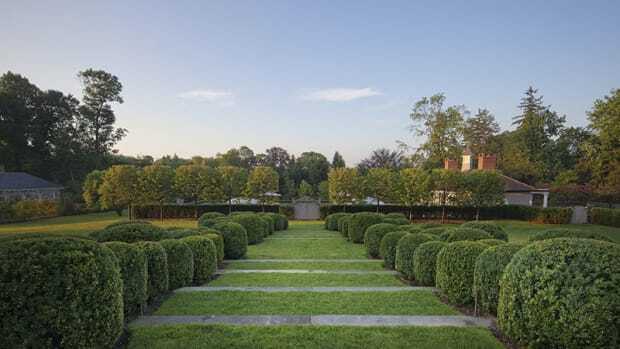 Two mature pin oaks and boxwood-hemmed parterres of cubed linden trees characterize the courtyard approach, focusing the viewer’s attention, once again, on the architecture of the house. 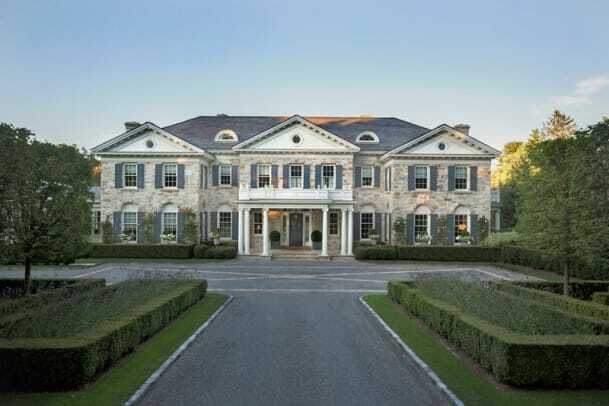 Meanwhile, mounded evergreen plantings and climbing roses soften the façade of the stately manor, while cast-limestone urns centered at each ground-floor window add a certain elegance. “A spectacular Longshadow urn was placed outside each window as a repetitive architectural feature that could be planted differently throughout the seasons,” explains principal designer James Doyle. In fact, lead planters are placed in multiple locations to accommodate seasonal colors. That architectural sensibility finds full expression throughout the landscape, both in terms of layout and plant selection. 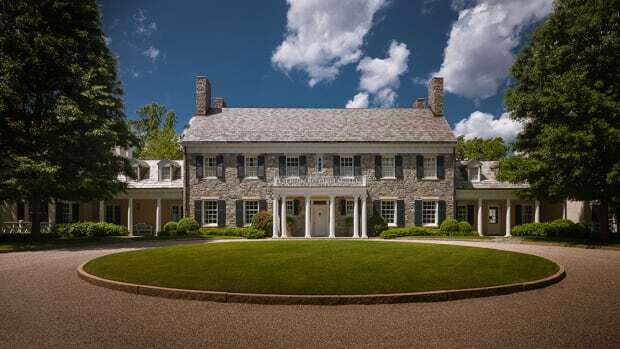 Rows of unclipped linden trees and gravel paths with stone inlays; light-toned, horizontally laid cut-granite masonry consistent with the stone on the house; and a long view with a backdrop of structured trees that terminates with a monumental urn are all elements that accommodate the architecture. Additionally, a pool house, furnished for outdoor dining serves as a symmetrical temple-like structure with Doric columns. Notable aspects of the garden design plan include a procession of gardens—starting at the front courtyard, where two hawthorn trees flank an entrance to the Cornus (dogwood) garden—leading to double herbaceous borders, where visitors find a private sanctuary-like space; a large limestone terrace with cascading steps down to a wide play lawn; and a mid-level terrace lined with colorfully planted borders and “conversation benches.” In short, the house now connects to all parts of the property via both visual and physical experiences.